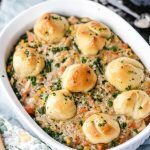 This Healthy Chicken Pot Pie with Biscuits is easy, delicious and is big enough to feed the whole family. Heart healthy, comforting and satisfying. Preheat oven according to biscuit instructions and prepare baking sheet, set aside. Using microwave, heat frozen vegetables in bag and follow microwave heating instructions. In a stock pot sauté the onion and garlic in cooking oil over medium high heat, being careful not to burn. Once the onion is softened and translucent, transfer to small bowl and set aside. Using the same stock pot, melt butter over medium heat. Begin to make a roux by whisking in 1/2 cup of flour then 1/2 cup of milk alternating between the two until 1 1/2 cups of each added. Whisk until no visible clumps and turn heat down to medium low. Add celery seed, black pepper and salt to roux, stir to combine using wooden spoon. Then add in chicken, steamed vegetables and chicken broth. Stir and turn heat down to low. Unwrap biscuits from container and cut each biscuit in half, roll each half into a small ball and place on baking sheet. Bake for ~8 minutes and check to see if cooked through. While biscuits are cooking, pour chicken pot pie mixture into a casserole dish. Once the biscuits are cooked, remove from oven and place on top of chicken pot pie. Turn oven temperature to 350F. Cover casserole with foil and bake at 350F for 8-10 minutes. Option to brush biscuits with cooking oil, garlic powder or butter prior to placing them back into the oven on top of the chicken pot pie. You don’t have to cut your biscuits in half. I liked the chicken pot pie mixture to biscuit ratio better with the halved biscuit, personally.